And, I will add a quick story of how God is at work in Cameroon. This morning, I was praying with five others : two were from Central African Republic, one American, one from Togo, and the last from Congo-Brazzaville. Each of us shared something that God has taught us this week and we prayed together. We prayed for the studies that they are doing and for their families back in their respective homes. We prayed for the work that they will go back to and the impact that it could have. All six of us are all involved in different aspects of Bible translation, usage, or literacy. Yet, I am becoming more and more convinced that some of the most important work we do is praying and then walking forward in the next thing God has for us. It might not seem like much, but I know that it makes a huge difference in innumerable lives. And, you can join in this work too. 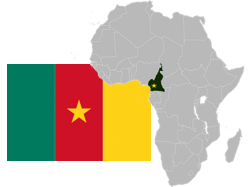 Please take a moment and pray for iDELTA and for Cameroon. Here are some suggested prayer topics. There’s a Cameroonian at the place where I work who used to work in the Computer Department. We grab lunch with every now and then. It’s nice to have someone else to connect with and he teaches me about Cameroonian culture and I get some additional French practice. A few weeks ago, he asked me to help him improve his English — so we’ve been working through a little English learning book. In this book is a story about a market. We talked about the story and he would ask me what certain words meant. One that was confusing to him was “hawker”. “Oh! Like a buy-em sell-em”. Then I had to stop him and ask him about these “Buy-em Sell-ems”. He said, “They are the ladies who sit by the site of the road and lay out a mat with their goods. A buy-em sell-em”. It turns out the French word here in Cameroon is “les Bayam-Sellam”. A couple days later Shannon was reading a news site and found that word “les Bayam-Sellam”. She didn’t understand what it was referring to until she read it phonetically. Although we are members of Wycliffe Bible Translators, working with SIL International in Cameroon, our comments on this blog are our own and do not necessarily reflect the perspective of either organization.